Nevada City, California, March 2, 2016 – Telestream® today announced Vantage Open Workflows, a new time saving encoding capabilities within its Vantage file-based media processing platform which create significant efficiencies in multiscreen broadcasting operations. Vantage Open Workflows will be showcased at NAB on booth SL4525. Telestream has developed Vantage Open Workflows in response to increased demand among news and sports broadcasters for OTT services to support multi-screen media distribution. The goal is to provide the news at the same lightening fast speed across a range of devices outside of traditional TV. Within a file-based workflow this presents a challenge since the core data file must be transcoded into several formats in order to be distributed across this broad and ever increasing range of mobile devices. This capability reduces processing time and empowers broadcasters to automatically access content as soon as it starts to enter the file-based workflow and before file ingest is completed. Consequently, the ability to deliver TV broadcasts and multiscreen content simultaneously becomes an achievable, cost-effective task. For applications where speed is not the primary driver, Open Workflows still bring significant benefits. The ability to orchestrate all of these file manipulation and conversion actions sequentially whilst the initial data ingest is still happening increases efficiency in operations throughout the facility. 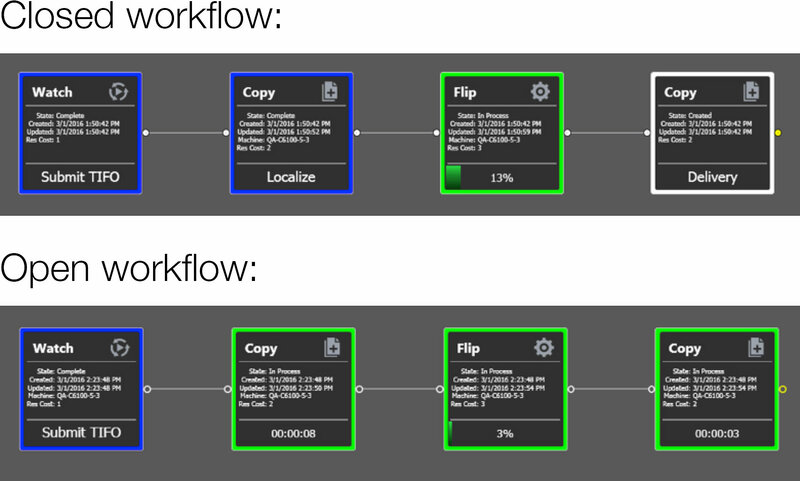 An important feature of Vantage Open Workflows is its ability to integrate seamlessly alongside third party systems, supporting existing file-based workflow operations. For example, many news broadcasters utilize Vantage as the primary ingest channel into their Avid newsroom system.